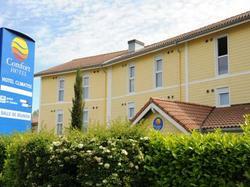 The Comfort Hotel Kiotel offers 34 air-conditioned rooms equipped with modern facilities. Situated in a quiet street, at the junction of the A43 and A46 motorways, the hotel is near a tramway station to Lyon city centre, and is only 15 min from Lyon International Airport. The reception is open from 06:30 to 23:00 from Monday to Friday included, and closed from 12:00 to 17:00 on Saturdays and Sundays. Please contact the hotel before your arrival if you plan to arrive outside the reception's opening hours. The hotel staff will try their best to make your stay for leisure or work as pleasant as possible. - Coming from Lyon, take Highway A43 direction Grenoble Chambery, exit 'Bron-Porte Des Alpes-Saint Exupéry'. - Coming from Grnoble-Chambéry by the Highway A43, exit N°3 "Espace Albert Camus", at the stop drive on your right along 150 meters. - Coming from Paris by the highway A6, arriving in Villefranche take direction "Lyon Centre" and follow A43 direction Grenoble-Chambéry. - Coming from Marseille by the highway A42,take the "Rocade Est" until joining the A43 direction Lyon. This room offers free Wi-Fi, satellite TV and a private bathroom.